Smoking is linked to cancer, emphysema, heart conditions, and dementia, and it can be difficult to break a lifelong addiction to tobacco. The following strategies can make it a little easier for seniors to give up smoking. Seniors need to be motivated if they are going to give up smoking, but just the risk of cancer alone may not be enough to make them quit cigarettes. You may want to highlight that smoking also increases the risk of infection and heart disorders and greatly lengthens the amount of time it takes to heal from surgery. 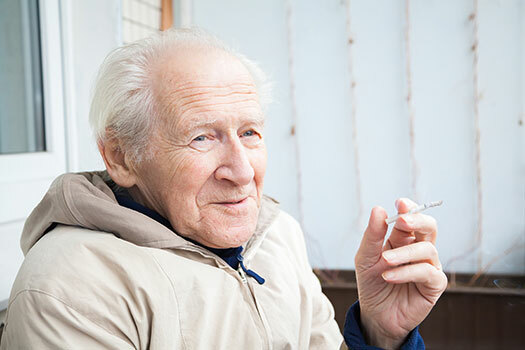 Giving up smoking is just one of the many ways older adults can boost their health. Seniors who want to remain healthy as they age can benefit in a variety of ways when they receive professional home care. Oakville, ON, Home Care Assistance is here to help your loved one accomplish daily tasks, prevent illness, and focus on living a healthier and more fulfilling life. Going “cold turkey” might be the quickest way to stop smoking, but many seniors find it almost impossible to do. All the stress could put your loved one in a gloomy and irritable mindset that makes it much more difficult to stop. Many seniors find it easier to gradually cut back on smoking instead of stopping it instantly. Smoking might seem like a physical activity, but it is often closely related to emotional and mental wellbeing. Things like communicating with a stressful family member, visiting a preferred smoking spot, or having a lot of physical pain might make your loved one want to smoke. Try to identify these triggers so you can help your loved one avoid being in situations that trigger the desire to smoke. Many smokers report that they cannot stop smoking because they want something to do with either their mouth or fingers. If your loved one has a desire to fidget, try to find other ways to fulfill it besides smoking. Many seniors enjoy chewing gum or snacking on something small like nuts whenever they want to smoke. It may also be helpful to give your loved one a fidget spinner or other toy to play with if he or she expresses a desire to hold a cigarette. Keeping your loved one distracted may help him or her quit tobacco. Your loved one can try a hobby like gardening, dancing, crocheting, or doing puzzles. Anything that keeps your loved one busy and takes his or her mind off of smoking can reduce cravings for cigarettes. Some seniors need help gardening and managing other tasks. Whether your elderly loved one needs part-time assistance with basic household chores or you need a break from your caregiving duties, the Oakville respite care experts at Home Care Assistance are here to help. All of our respite care services are backed with a 100% satisfaction guarantee, there are no hidden fees in our contracts, and we never ask our clients to sign long-term contracts. Many seniors have a habit of giving up on their goal to quit smoking as soon as they make one mistake. Try to encourage your loved one to take it one day at a time. Even if your loved one smokes one day, he or she does not have to give up and smoke the next day. Older adults can give up smoking by making a few healthy lifestyle choices. If your aging loved one needs help managing everyday tasks or encouragement to adopt healthier lifestyle choices, turn to Home Care Assistance, a leading provider of elderly care. Oakville Home Care Assistance provides professional in-home caregivers around the clock to help seniors live longer, happier, and healthier lives. To learn about our high-quality in-home care plans and how they can benefit your loved one, give us a call at (519) 590 2792 today.